Jonathan Weiss, longtime LA Bicycle Advisory Committee, has discussed the history of BMX racing with us before, including the birth of the sport right here in Los Angeles. So when I received the following email from him over the weekend, I wanted to share his thoughts with you. I have a local history addiction. I’m into bicycling. And I hopped off curbs on my Schwinn as a kid in suburban Detroit. So, when I learned that Palms Park in the nearby Palms district of West Los Angeles was the birthplace of BMX, I had to do something about it. I could imagine and identify with some these local kids (and others they attracted) racing up, down, and around some hills on their modified Schwinn Stingrays like motocross racers and with races sanctioned (entrance fees, awards and even insurance) by Los Angeles Recreation and Parks Department. This nearby park was the Elysian Fields, the first field of dreams, the epicenter of the first X-Games sport. So, I put together some of the story, I set up a Facebook page, and I got in touch with some of those who started BMX racing. That’s the fun part of history. The tougher part is when some of the participants and eye-witnesses to history, those who I’ve been lucky enough to get to know, start to go. On October 1st, another left us – Rick Twomey. From me, and from fans from around the world, thanks for sharing your memories with me and on the Facebook page, Rick. And thanks for what you’ve left behind. If we’re lucky enough to have the 2024 Olympics in Los Angeles – with BMX competition in Long Beach – I know I’ll be thinking of you, innovator, sponsor, and author Rick Twomey, and of Rec and Parks’ Ronald Mackler, who left us in 2010, and of Scot Breithaupt, who left us last year. Note: I failed to mention that Weiss left the BAC earlier this year. We all owe him a round of thanks for his years of service to LA’s bicycling community. 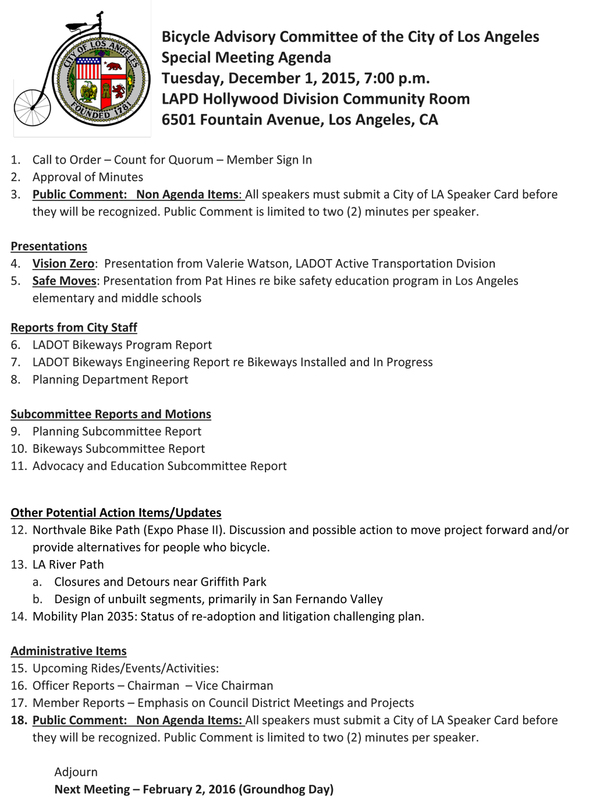 Speaking of the BAC, the next bi-monthly meeting of LA’s only official voice for bicyclists is tomorrow night in Hollywood. If you missed it, bicyclists sadly lost their lives in both Palm Springs and Yorba Linda over the weekend. The Los Angeles County Bicycling Coalition’s Tamika Butler spoke about Planning While Black at the NACTO Designing Cities Conference last week, with a presentation that reportedly brought down the house. CiclaValley complains about serious city inaction on clearing the dirt hazard in the Forest Lawn bike lane. Mickey Rourke is one of us, as he takes his dog for a ride in WeHo. Santa Monica police arrest a man for attempting to steal a number of bicycles from the Bike Center after employees wrestled him down. Plans are in the works for a single, integrated bikeshare system that would include Santa Monica, Beverly Hills, West Hollywood, Long Beach and UCLA, with possible expansion to Culver City and the South Bay. Rolling Hills Estates, Rancho Palos Verdes and Palos Verdes Estates make plans to work together to address traffic and safety issues across city borders on the peninsula, as South Bay bicyclists push for greater safety on the roads. The Pasadena Complete Streets Coalition is holding their October meeting tonight. 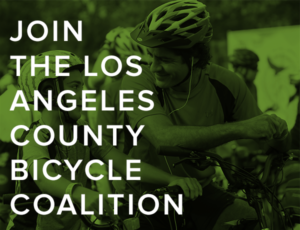 Bike the Vote LA is hosting a ballot party in DTLA tonight to discuss choices for next month’s phone book-sized ballot. Get your pizza delivered poolside by bicycle in Palm Springs. 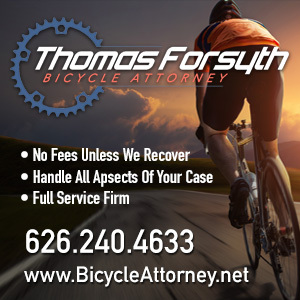 The San Luis Obispo District Attorney proves it is in fact possible to charge a driver who wasn’t texting or under the influence with vehicular homicide for killing a cyclist — in this case, a champion triathlete and the wife of a Cal Poly dean. The story of Benicia cops buying a new bicycle for a teenager who was walking four hours a day to get to and from work has gone around the world. Napa County tries rumble dots, rather than rumble strips, to keep drivers from drifting off the road, and protect bike riders on the shoulder. Sad news from Modesto, where a bike rider was killed in a collision Friday night. A horrifying story from Redding, as a man believes he was attacked while riding his bike to the drug store, but can’t remember what happened after suffering a broken arm and eye socket, along with multiple skull fractures. A government website says sharrows don’t make bicycling in urban areas any safer. Yes Magazine says women are being left behind even in the most bike friendly states, and offers suggestions on how to change that. A sports website looks back on the Tour de Trump, the American bike race sponsored by the GOP’s current presidential candidate for a two whole years back in the ‘80s. Colorado Springs CO residents can’t seem to grasp the concept of a road diet, let alone give time for traffic to adjust. A Polish bike rider sets a new record for bunny hopping 3,461 steps up the former Sears Tower in Chicago. A Chicago letter writer says bikes should be banned from the city’s busiest streets, insisting that bicyclists somehow make traffic worse by never obeying the law on streets he claims are paid for with gas taxes. Never mind that public taxes pay for city streets, traffic is caused by all those cars, and most drivers aren’t all that law abiding, either. A Connecticut man returns home after a 12,124 mile ride around the perimeter of the US to help ensure veterans have enough to eat. A new study finds that every $1,300 spent on New York bike lanes adds another year of life to the overall population of the city. A New Orleans bike rider plans to keep riding even after she was the victim of a hit-and-run. A Florida man faces criminal charges for putting a milk crate on his bike. The next bus driver who honks at you may not be one. Stunt cyclist Danny MacAskill offers advice on how to fall off your bike, while Bike Radar tells you how to hose it down. Caught on video: A London pedestrian berates a bicyclist for riding through a crosswalk when people are using it. A former Premier League soccer player plans to run and ride 1,000 miles linking 44 UK soccer stadiums. A one-legged Irish cyclist sets the world’s first Paralympic hour record. Here’s your chance to cross the Rubicon and take a month-long European bike tour in the steps of Julius Caesar. A Dutch study concludes bike riders will usually choose the most comfortable route rather than the most direct. California’s former Governator is busted for biking in the Munich rail station. Bicycling continues to grow around the world, as Iranian cities Isfahan and Neishabur work to accommodate bicyclists, though Tehran lags behind. New Zealand bicyclists push for a repeal of the country’s mandatory helmet law, even though the country’s leaders appear to have no intention of doing so. Who was that meth-carrying masked man on the lightless bike? It’s one thing to carry a joint when you ride; another to carry the entire plant with you. And this is not the proper use of a bicycle, no matter how pissed off you are. L’shanah tovah to everyone nursing a Rosh Hashanah hangover this morning. Apparently tired of telling kids to get off his lawn, a curmudgeonly SaMo writer complains about a whopping four — yes, four — Main Street parking spaces that are being converted into parklets, which will evidently prevent anyone from parking anywhere in the neighborhood ever again; he similarly bemoans the parklets and loss of traffic lanes on Broadway in DTLA. As an aside, the story mentions that the Santa Monica Planning Commission will meet on Wednesday to consider the city’s bike and pedestrian plans, which he’s clearly not in favor of, either. 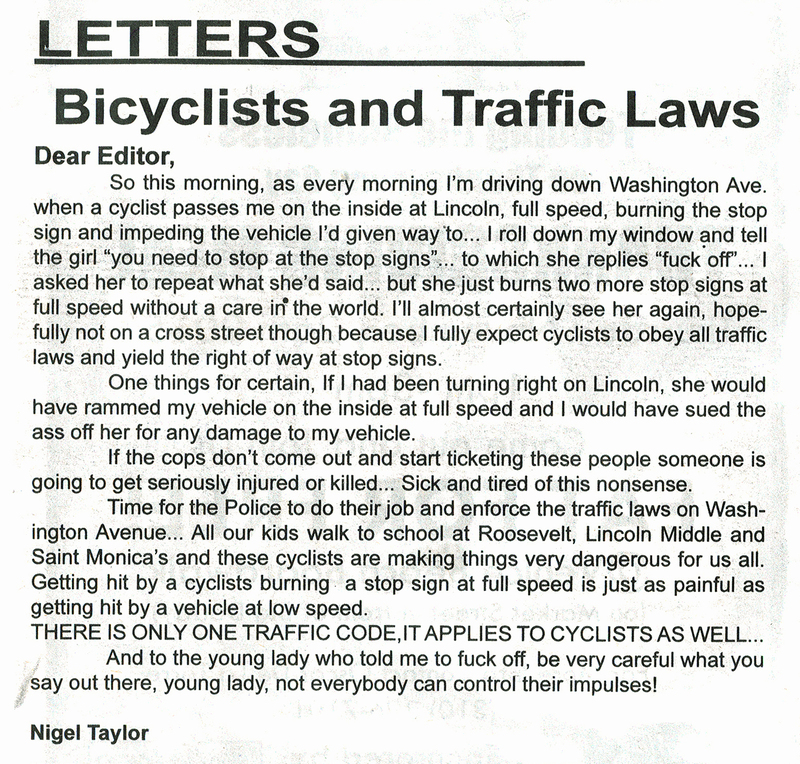 Meanwhile, Dr. Michael Cahn forwards this letter copied from the Santa Monica Observer, in which a driver is offended when his attempt to educate and/or enforce bike traffic laws from behind the wheel of his car is met with a predictable response. 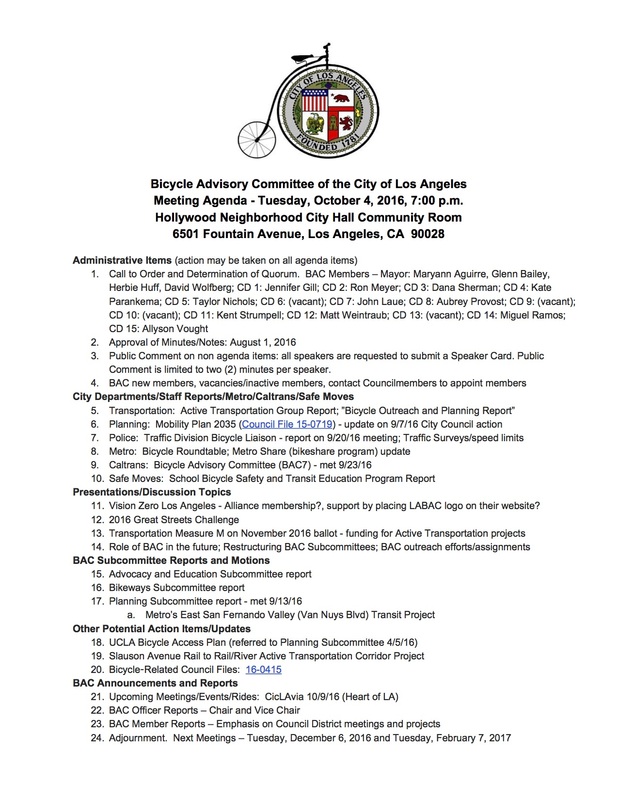 LA’s Bicycle Advisory Committee, the city’s only official voice for bicyclists, meets tonight in the LAPD Hollywood Division Community Room, 6501 Fountain Ave. The story of popular Silver Lake Trader Joe’s parking lot attendant Egee Mabolis is picked up by LAist and the Eastsider, following the bicycling injury that left him with no feeling in his arms and legs. A gofundme account to help defray his medical costs has raised 3/5 of the $25,000 goal. After all, it is Giving Tuesday. Speaking of Giving Tuesday, you can bid on a Silca SuperPista Ultimate Bicycle Pump hand-painted by cycling scion Taylor Phinney, with 100% of the proceeds going to support the Davis Phinney Foundation to fight Parkinson’s Disease. Phinney — Taylor, not Davis — is putting off additional surgery on his badly injured left knee in hopes of competing in next year’s Rio Olympics. And with a little luck, a $10 donation to the (RED) campaign to fight HIV/AIDS could get you ice cream and ride through Central Park with U2’s Bono. Take a few minutes out of your day for this must-read piece from CiclaValley, in which he surprises a driver by saying he was lucky he got in a collision, even with his kids in the car, and even if the red light-running driver who hit him seemed to think it was no big deal. Next City offers a much better take on the documentary Bikes vs. Cars than yesterday’s Daily Beast hatchet job; the film opens at the Laemmle NoHo 7 this Friday. Bicycling takes a very brief look at LA artist cycling tour guide and bike salesman Adam K. Masters, and how he got hooked on track racing. Former DC and Chicago DOT chief and current author Gabe Klein calls for creative solutions like protected bike lanes and bikeshare stations to improve transportation in LA, along with a switch to self-driving cars. A new video from Metro explains how to use the Metro Bike Hub at El Monte Station, which promises to be just the first of several throughout the LA area. Temple City will consider a proposed redesign of Las Tunas Drive into a more vibrant, safe and people-friendly business district at tonight’s city council meeting; supporters of a more livable, walkable and bikeable street are urged to attend to counter expected opposition. Good read from a cyclist who offers seven lessons he learned from riding 673 miles from San Francisco to San Diego with no idea what he was doing. Oceanside residents are calling for safety improvements to the city’s main drag following the death of 12-year old Logan Lipton while he was riding his bike to school last month. The Coronado bike lane madness goes on, as a letter writer says the town doesn’t need bike lanes because they didn’t slow traffic on a street where average speeds were only 28 mph to begin with. Two local businesses come to the rescue after a burglar steals 26 bikes from a San Francisco middle school. A San Francisco bike deliveryman comes to the rescue after a women gives birth to a premature baby on the sidewalk. Stockton is holding a number of public workshops to update their Bicycle Master Plan. Let’s hope they don’t have to deal with lawsuits and recalcitrant councilmembers trying to overturn the public process, like some cities we could name. The Pew Charitable Trusts says bike tourism means business, as cities and states are warming to the economic benefits of bicycling. Seriously? Oahu residents suggest ticketing bike rental shops when their customers break the law. Which makes no more sense than holding car rental firms accountable when their customers speed or run red lights. Indianapolis drivers are apparently confused by the city’s first parking protected bike lane. City Lab says laws prohibiting bicyclists from wearing headphones, like one under consideration in Massachusetts, miss the point. Several writers, including frequent contributor Megan Lynch, beg to differ. Brooklyn bike riders call for a statewide Idaho stop law. The Wall Street Journal belatedly discovers that retirees are getting on their bikes. Note to the Journal: 50 ain’t exactly old. A Philadelphia conference calls for Vision Zero to protect the lives of bicyclists and pedestrians; Toronto discusses the idea, as well. A Delaware driver faces up to seven years for killing his bike-riding friend in a drunken hit-and-run. Interesting idea from Florida, as a proposed law would require in-ground safety lights where bike paths cross roadways to alert drivers to the presence of bicycles. Bighearted Tampa police officers chip in to buy a five-year old a new tricycle after his brand-new birthday bike was stolen in a car burglary. Vancouver, which has made a massive investment in protected bike lanes, is rated Canada’s safest major city in which to ride a bike. The Yukon tourism board wants you to explore the Great White North by fat-tire bike. Brit bike riders are being offered a better deal on car insurance because they’re better drivers. Thanks to joninsocal for the link. ‘Tis the season. A bighearted four-year old British girl donates her new birthday bike so someone else can wake up to a new bike Christmas morning. UK cyclists are being criticized for excessive speeds after single rider is clocked on Strava approaching 30 mph. It’s a dream come true. Bike riders in one Danish town can outfit their bikes with special RFID tags that turn traffic lights green as they approach so they never have to stop for red lights. Aljazeera says carless cities are the future of Europe. Maybe the idea will cross over to this country before we’re all old and grey. A South African cyclist says the way to deal with dangerous roads is to stay off them when you can, and ride facing traffic when you can’t. Which is exactly the wrong thing to do. Life is cheap in Melbourne, as an Aussie driver is fined a lousy grand for a fatal dooring. ‘Tis the season, too. An Australian town responds to complaints that it has the world’s worst Christmas tree by creating one made out of bicycles. If you’re trying to make your getaway by bike with a meth pipe and stolen guitar, make sure you can ride with it first. Or if you’re going to steal a bike, make sure the owner isn’t still attached to it. And here’s your chance to ensure the Star Wars fan in your life ride gets to ride with his or her very own R2D2 bike helmet. 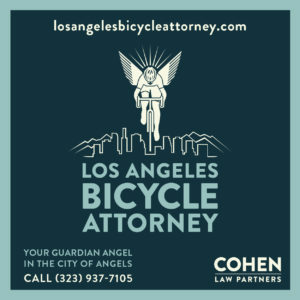 Thanks to Todd Munson for supporting this site by contributing to the BikinginLA Holiday fund Drive. The first time I attended a meeting of the Los Angeles Bicycle Advisory Committee, I sat silently in the auditorium at the old Parker Center, where the BAC used to meet. Afterwards, a small man approached me unsteadily, trembling with age, but without hesitation. And asked why I was there. It wasn’t a challenge, as the phrase so often is. It was an offer to help with whatever problems had led me to attend. When I explained I just there to observe the committee, he invited me to come back again. And said to to let him know if there was anything they could help me with. Then he turned and walked away on those unsteady legs. And with that, I had just met Alex Baum. 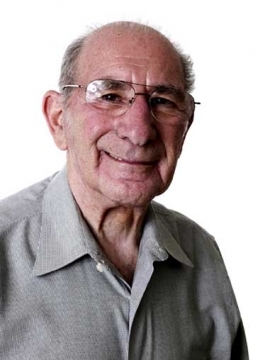 The founder of the BAC and the father of modern bike advocacy in the City of Angels, who passed away early Sunday at the age of 92. That alone would be enough of a resume to cement anyone’s legacy. But for Baum, it’s little more than a footnote in a truly extraordinary life. A native of German-speaking Lorraine, France, he was in his late teens when the Nazis overran the country. Rather than flee, the young Jewish man chose to fight, joining the French resistance along with his brother. Captured while attempting to guide an English pilot to safety, Baum somehow managed to hide his heritage, and spent the next two-and-a-half years as a political prisoner in Nazi concentration camps. According to the LADOT Bike Blog, he spent his time in confinement building — and sabotaging — the V2 rockets Hitler lobbed across the English Channel. After the war, he rebounded to play soccer, first for the French national team, then as a center-forward for a Chicago semipro team before moving to Los Angeles in 1960 and establishing a successful business. Yet it’s his lifelong love of bicycling that led him to leave a lasting footprint on the city, and on the sport itself at the highest levels. In fact, it’s Alex Baum who should be credited with the rise of women’s bike racing, which this year will see professional races at the Tour de France and Spain’s Vuelta a España, as well as four days of racing at the Amgen Tour of California. Because he was the one who ticked the box that brought women’s road racing to the Olympic Games, with an inaugural race at the ’84 Olympics that saw Americans Connie Carpenter and Rebecca Twigg take gold and silver, respectively. And let girls around the world know they could compete at the highest levels. In fact, he was instrumental in bringing the games to LA, after serving first as a board member of the United States Cycling Federation — which would later be rebranded as USA Cycling — then later as the first American appointed to the Union Cycliste International, the governing body for international bike racing. That alone should have been enough for anyone. But for Baum, it was just a start. He also gets credit for building velodromes in Encino and Dominguez Hills, and at the Olympic Training Center in Colorado Springs. And he was influential in the birth of the Tour of California, according to the LADOT site. It was also Alex Baum who first approached then-Mayor Tom Bradley about forming a city committee to serve the interests of bicyclists and improve the streets for everyone on two wheels, serving as chairman of the BAC for over 30 years under four successive mayors. And continuing as chairman emeritus of the committee right up to his death. 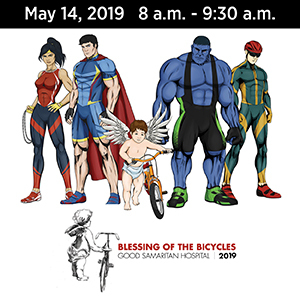 As leader of the BAC, he can be credited with helping in the development of the 1996 and 2010 bike plans, and leading in the creation of the LA River Bike Path. As well as working towards completion of the path all the way from LA to Long Beach. In other words, if you ride a bike anywhere in Los Angeles, you owe Baum a round of thanks. Despite the obvious effects of age, it almost seemed like he’d be here forever, guiding the city forward to a more bike friendly future. And maybe he will be. Because his influence will live on right here on the streets of LA as long as any of us ride them. Word of his death came Sunday afternoon in an email from his longtime friend and associate, LADOT Senior Bicycle Coordinator Michelle Mowery, who said he passed away surrounded by family early that morning. In some ways, though, we are all his family. And he will be long missed by a city that he changed for the better, yet one that barely knew him. According to Mowery, his memorial will be held at 1:30 pm this Wednesday at Santa Monica Synagogue at 18th and Broadway. If you plan to attend, you’re asked to RSVP to his daughter at dgardnersm @ aol.com. Personally, I’d like to see LA’s current mayor and the BAC Baum served for so many years host a public memorial at the bicycle bridge named for him over Los Feliz Blvd. It would be a fitting chance to say goodbye to one of the true giants of our city, and our time. Update: David Wolfberg has written a wonderful remembrance of Alex Baum on the BAC’s Facebook page, adding much detail to his time in the French resistance, as well as with the Olympics and LA bike advocacy. It’s definitely worth reading. My prayers and deepest sympathy for Alex Baum and all his loved ones. Thanks to the Jewish Journal and LADOT Bike Blog, whose profiles provided the basis for this piece. Maybe LA city government really is becoming more open and accessible under Mayor Garcetti. For the first time, you can sign up for reports and agendas from a long list of city agencies and committees — including the city’s long-neglected Bicycle Advisory Committee. You’ll find them listed under the LADOT heading, where you can opt to receive BAC agendas and minutes, as well as other LADOT groups including the Pedestrian Advisory Committee. And just below, you’ll find reports from the police and fire commissions. Both of which have a lot to say about your ability to ride legally and safely. Thanks to BAC members David Wolfberg and Glenn Bailey for the heads-up. The LAPD cracks down on salmon cyclists at USC, calling it a last resort in response to a rising number of bike collisions on and around the campus. Actually, the last resort appears to be campus officials acknowledging the high level of bike commuting students, and working with city officials to accommodate bike riders so they don’t feel a need to break the law. There’s a reason UCLA is recognized as a bike-friendly campus. And USC isn’t. Laemmle Theater president and LACBC board member Greg Laemmle says we need good policies and urban planning, and smart business practices to encourage bicycling and walking in LA County. A 16-year old LA student transforms his life — and his formerly 250 pound body — by biking to school. Flying Pigeon’s Richard Risemberg attends a glum Bicycle Plan Implementation meeting, which brightens considerably when he discovers new LADOT head Seleta Reynolds had been listening patiently for the whole meeting. Turns out she stopped by Tuesday’s BAC meeting, too. Ride to celebrate the new San Gabriel Mountains National Monument, expected to be announced by President Obama on Friday; CORBA offers only conditional support for the designation. Cyclists are invited to participate in a public workshop on October 22nd to develop a joint bike plan for Agoura Hills, Calabasas, Hidden Hills, Malibu and Westlake Village. A new two-mile stretch of bike path opens along Coyote Creek in La Mirada. Inland riders are gearing up for Sunday’s Temecula Valley Century, with five rides ranging from 6.4 to 101.5 miles. None of which is a bike race, regardless of what the Press Enterprise might say. Local merchants are on board this time for Salinas’ second ciclavia. The SF Gate talks with the Sonoma County Gran Fondo cyclist felled by a squirrel through the spokes; he was lucky to get away with a concussion and minor facial fracture. And you don’t want to miss that amazing photo of the squirrel jammed in his wheel; then again, maybe you do. Thanks to Kent D for the second link. HTC unveils a periscope shaped cam to compete with GoPro. A Seattle website explains what happens after your bike is stolen. And it ain’t pretty. Now that’s more like it. A Texas driver gets 18 years — yes, years — in jail for killing a cyclist while under the influence. He was caught attempting to hide the victim’s body after driving away with his headlights off when the bike rider tumbled into the bed of his truck following the collision. A Kentucky teenager apologizes for throwing a cup of ice at a cyclist and goes for a ride with his victim; does it matter that a judge ordered him to do it? There’s a special place in hell for someone who’d shoot a seven-year old Detroit girl out riding her bike; she was collateral damage in a car-to-car shootout. Bad enough when people drive in the bike lane; worse when they get high and drive down a Michigan bike path. Bikeyface complains about bike lane bike creeps. We may have to worry about rabid LA drivers, but New Jersey cyclists have to deal with rabid coyotes; I’m not sure which is worse. Many cyclists have ridden along the Hudson River, but not many have actually pedaled across it. The Orlando paper endorses a plan for a continuous 275-mile bike trail from the Atlantic to the Gulf coasts. London, Ontario cyclists reject the city’s new bike plan as too little, too late. A Brit police and crime commissioner says cyclists should be forced to wear numbered plates big enough to be read at a distance so they can be identified and prosecuted when they break the law. After all, that’s worked so well to curb law-breaking by motorists, right? Despite what the local authorities say, the jerks who stretched a cord across a British roadway at neck height aren’t morons, they’re terrorists attempting to injure or intimidate bicyclists and motorcyclists. Good thing cycling has cleaned up it’s act. Otherwise, the Astana team could be in trouble after not one, but two riders test positive for EPO. Tres shock! An Aussie study suggests cyclists break the law because they don’t feel safe on the streets. Caught on video: Extreme off-road Lego bike stunts. Yes, Lego. Evidently, they really are out to get us, as a car — a real one — crashes into a Brit bike shop, at least the 10th time it’s happened to the same store. And a rare condition can give cyclists a third, non-functional testicle — including riders who weren’t born with two.